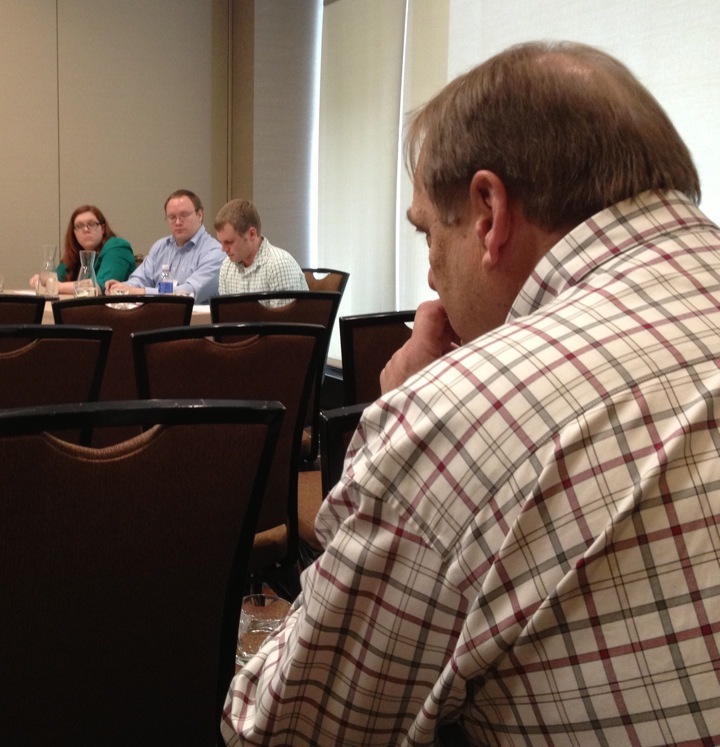 Tom Isern at right listens to his student of history, Aaron Gutman, deliver his paper on the microhistory of three Prussian soldiers mustered into the US Army in 1862 to help with the defenses at Fort Abercrombie, Dakota Territory. It is now Saturday evening and I am finishing up another robust Western Social Science Association conference, this time in the Queen City of the Great Plains that is Denver, Colorado: a cosmopolitan cattle town and gold mining stop at the edge of the Great Plains and the Rocky Mountains (it was in this location that in the second half of the 19th century, south-north moving cowpunchers and cattle trails intersected with the east-west moving overland settlers, miners and pioneers). This morning Aaron Gutman (North Dakota State University) delivered his paper, “The Siege of Fort Abercrombie D.T. 1862 and its Global Connections,” emphasizing the ethnic make-up of three German-Prussians commanding the cannon battery for the US Army during the siege at the fort in late-August and through September of 1862. Gutman was apt to point out that the Prussian immigrants mustered into Civil War service were experienced with street fighting, having come from the renegade and liberal streets of the German revolutions of 1848. I also had a great time listening to Alex Steenstra (Northern Arizona University) and Christine Cheyne (Massey University, Palmerston North, New Zealand) talk about the Mighty River Power struggle between the Maori and the New Zealand Crown, and the fracking going on today in New Zealand. Mexico City in downtown Denver, Colorado. Yet as historians, archaeologists, humanities folk and social scientists considered what happened and what is happening in great detail at these conferences, we also take account of our contemporary surroundings. This includes food, music and drink. 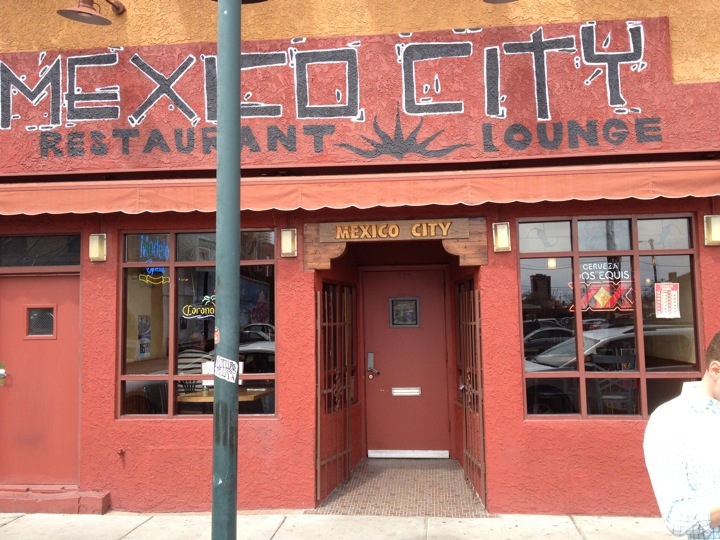 So a quick run-down of some of the dining establishments visited during this professional conference include the spectacular Biker Jim’s hot dog joint (I had the delicious duck-cilantro dog), and the restaurant Mexico City, both in one of Denver’s historic districts. There was some Thai place that we visited too (the name escapes me, but I have found inspiration with the lemon grass coconut soup, and will be bringing the general recipe idea back to the northern Great Plains). Of music, I got to see the Tejon Street Corner Thieves belt out some street-level blue grass, and I purchased one of their DIY CDs for the street-level market price of $5.00. Of drink, there is an infinite amount of barley pop varieties to try, and I have taken to the stuff in the can — an archaeologist friend of mine in Missoula calls these “canned goods.” But I better wrap this up because the 55th Annual Western Social Science Association conference reception begins in less than 20 minutes. This entry was posted on Saturday, April 13th, 2013 at 7:29 pm	and tagged with Colorado, Denver, Fort Abercrombie, New Zealand, North Dakota, Western Social Science Association and posted in Uncategorized. You can follow any responses to this entry through the RSS 2.0 feed.